The traveling Holy Family Statue is made available through the generosity of a former Parent Prayer Group, to any St. Monica family member who would like to reserve it for a week at a time. It is our hope that the statue will be placed in a prominent location within your home and that the enclosed prayer to the Holy Family will be prayed each day with all members of the family. In this way through the grace of God, we will strengthen the Domestic Church, one family at a time. 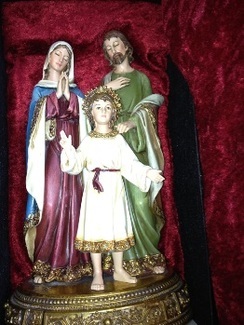 The statue and prayers are contained within a padded box and can be picked up and dropped off at the main school office.